Jessica Simpson attended the 100th Annual White House Correspondents’ Association Dinner held at the Washington Hilton on Saturday (May 3) in Washington, DC. The singer wore a black-and-white rose-print Carolina Herrera gown featuring a bustier-style bodice and a skirt which is fitted through the hips before and accented with delicate chiffon ruffles which pool on the floor, fanning out to make a train. Both the dress and styling is great, but the awkward pose is ruining this look for me. I also think this look would’ve benefited from a high updo. 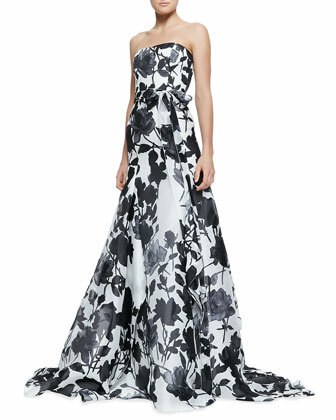 You can buy Jessica’s Carolina Herrera Strapless Rose-Print Ball Gown from Neiman Marcus and Bergdorf Goodman.